Burnley’s Sophie Hitchon produced a season’s best throw of 71.02m to win the hammer at the Loughborough International on Sunday – and achieve the World Championships and Olympic Games standard in the process. Sophie has only ever thrown beyond that mark five times in her career so far, and in doing so, she beat the Beijing World Championships 2015 qualifying distance of 70m, and the Rio 2016 standard of 71m. Her effort was the best of a promising start to the new season. She won the Payton Jordan Invitational in Palo Alto, California, at the start of the month with 69.20, and backed that up with 69.45m to finish seventh at the Seiko Golden Grand Prix in Kawasaki, Japan, last weekend. 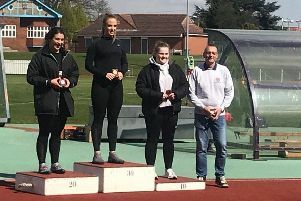 On Saturday, she threw 68.41m to claim sixth place in Halle, Germany at Hallesche Werfertage, before completing a busy weekend in Loughborough at the International event, helping England Athletics to a meet win ahead of Great Britain Juniors, Loughborough Sport and Scotland Athletics. This year Sophie’s major focus will be on the 15th IAAF World Championships in Beijing, China at the end of August, with a second Olympic Games appearance to follow next summer. The International Association of Athletics Federations entry standards for Rio 2016 were approved on April 15th, with qualifying opening on May 1st, running until July 11th next year. Single entry standards for each gender have been announced, rather than A and B standards. Each country is allowed to enter a maximum of three athletes per individual Olympic event, provided those athletes have all met the entry standard, and Sophie, is the only British athlete ever to have thrown over the Olympic women’s hammer qualification target of 71m, holding the British record with 72.97m, achieved in 2013 at the European Athletics Team Championships at Gateshead. For Sophie, Beijing will be a third World Championships, having finished 19th overall in qualifying at Moscow 2013 with 68.56m, and 13th in her qualifying pool in her first taste of the Worlds in Daegu with 64.93m. She was 12th at the London Olympics in 2012, throwing a then-British record of 71.98m, and was 2010 IAAF World Junior Championships gold medalist, and 2008 Commonwealth Youth Games champion. Burnley College hammer star Charlotte Williams returns with a vengeance!